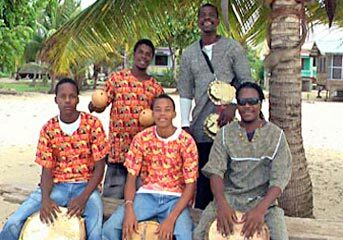 Hopkins is one of a handful of villages situated along the Caribbean coast with an active Garifuna population and a fascinating black culture; a mixture of Carib and African influences with its own language, music, food and customs. 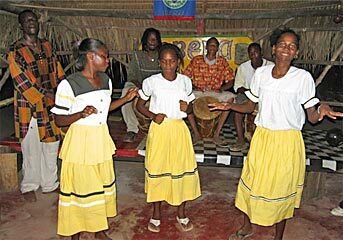 A couple of excellent websites that provide information about this culture are: Garifuna.com and Everyculture.com. The people who live here live life at a much slower pace. They are friendly and hospitable and happily welcome visitors to their corner of the world. Our cabanas are located at the north end of the village and many of our neighbours are Garifuna. If you want a taste of this unique culture, you can't do much better than on our little beach. 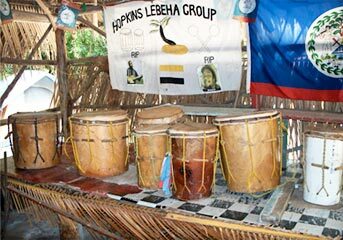 The Lebeha Drumming Center is one of the main focal points for Garifuna culture here in Hopkins. Jabbar Lambey leads the effort to preserve the tradition of drumming by teaching the younger generations. Lessons are also given to interested visitors. 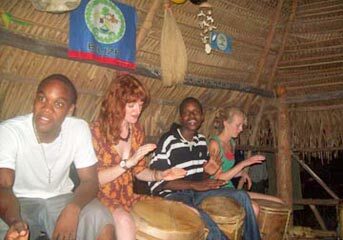 Only a couple minutes away by foot, the Drumming Center is a fun place for locals and tourists during the evening. Exactly one half mile from the center of town, the Lebeha Drumming Center is located at the north end of the village along the main road. Look for the sign on the right hand side of the road. Or better yet, ask any local. Everyone knows where the drumming center is. The drumming center is open year round for accommodation during the busy season and drumming practice often takes place on weeknights and most weekend evenings. In addition, Jabbar will often scare up some drummers upon request. We offer both private or group lessons.Â Drumming lessons are by appointment and can be arranged in advance or after your arrival.